The ultimate in luxury beachside living has arrived in one of Melbourne’s most highly sought after locations. 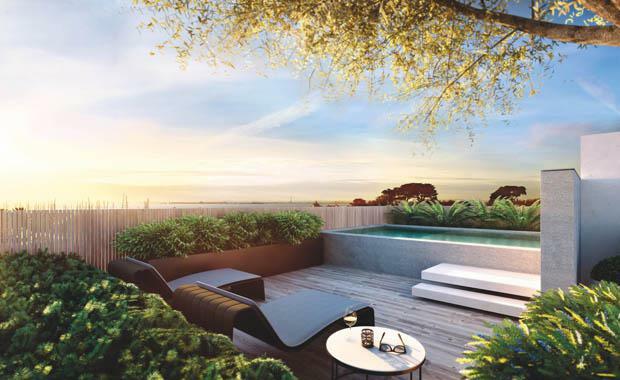 The two ground floor apartments have private courtyards, and the two upstairs apartments boast spectacular rooftop terraces with plunge pools and views of Port Phillip Bay. Full height windows give views to the surrounding easy to maintain, lush vertical plantings whilst the designer kitchen acts as a centrepiece to the apartment, with views to the living areas and gardens. According to Hassell Principal Scott Walker, aside from the commitment to quality, the generosity of space is one of the project’s greatest assets. “Spacious hallways with garden views maximise access to daylight, while beautifully crafted joinery and detailing signifies the commitment to a ‘no cutting corners’ approach,” Mr Walker said. According to landscaper Jack Merlo, Sandown St is the evolution of a partnership of ideas. “The layered garden elements create serene environments, interacting seamlessly with each interior space,” Mr Merlo said. Selling agent Rachael Bath, who is a director of B&B Property Group, said the Evergrande team, together with its consultants, has taken time with the design process and has successfully injected a level of youthfulness into the local market. “An enormous amount of care and thought has gone into delivering residences that push the envelope of luxury in Brighton,” Ms Bath said. The four, three-bedroom residences with en-suites and walk-in-robes for main bedrooms, plus powder room, are sized from 230 square metre with outdoor areas up to 210 square metre and are priced from $3.75M. They include spacious living rooms, large open fireplace, study areas, as well as gardens. Each apartment has secure parking for three vehicles and large storage areas located in the basement.